It’s a fact. You still have to pay your life insurance premiums even if you are disabled, not working, and not making money. As you know, life insurance is important coverage. You don’t want to stop paying your premiums to save money, because upon disability, you may never obtain life insurance coverage again. Many carriers offer a waiver of premium – at an additional cost. The waiver of premium will pay your life insurance premiums if you are diagnosed with a disabling condition. Before you say, where do I sign up, we feel you have a better option. 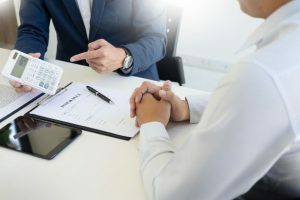 In this article, we describe the waiver or premium and discuss a better option for the waiver of premium for life insurance. The waiver of premium is a rider, and it is just as it sounds. This rider will waive your payment of life insurance premiums upon a covered disability. While this sounds good, let’s analyze this rider in more detail. Is it worth your money? Many carriers offer a waiver of premium. Here is an example. Let’s assume a female named Laura, age 40, is a non-smoker and in standard health. She wants $500,000 of life insurance coverage and works as a dental hygienist, a very specialized profession. She is looking for a 20-year term life insurance policy. Her agent tells her about the waiver of premium and how 1 in 3 workers in their lifetime face a long-term disability. That has her worried, especially since she uses her hands a lot. The agent quotes her $56 per month life insurance rate including the waiver of premium. Without the waiver, the life insurance premium is $47 per month. The waiver of premium costs an extra $9 per month. She feels good about it. What does this all mean? We discuss that next. After reading the next sections, you will have the power and understanding that most waivers of premium offered by life insurance companies are a waste of money. Yes, that is right! The waiver of premium essentially is a long-term disability insurance policy. Upon a properly covered disability and you meet the life insurance waiver or premium guidelines, the carrier will pay for your life insurance premiums. This is basically a disability insurance policy. As you know, we specialize in helping people enroll in disability insurance. Disability insurance can be confusing for many individuals and agents alike. Yet, it is extremely important coverage. Many people don’t have disability insurance. Or, they have some, but not enough. In our opinion, the importance of disability insurance trumps term life insurance. That is how important we feel it is. Next, we discuss the elements of the waiver of premium we illustrated in our example above. What is total disability? It simply means you can’t work. At all. A doctor verifies your total disability. Upon making a claim with the life insurance carrier, you will need to provide doctor’s records or statement attesting to your disability. Did you know that nearly all long-term disabilities do not start out as total? They don’t. They are usually partial disabilities. This means you can work, but not full time. Think about your friends, family, and coworkers. Do you know anyone partially disabled? Partial disability can happen upon an accident, an illness (like cancer or multiple sclerosis), or any other situation. Let’s say Laura injures her hand. Her doctor limits her to 2 days of work per week. Will her life insurance carrier approve the waiver of premium request? Provided the other conditions in her contract are met, no. She is partially disabled, not totally disabled. The elimination period (or waiting period) is the time that elapses before the carrier pays any benefit. The elimination period reduces any claims for short-term disabilities. This keeps the cost of the waiver of premium low. However, in our example, a 9 month waiting period is excessive. Unfortunately, this level of elimination period is all too common in the waiver of premium riders. Many carriers have a minimum of 6 month elimination period. Let’s say totally disabled occurred on January 1. She would not be eligible for the waiver of premium until October 1!!! In other words, the carrier won’t pay until October 1. The Definition Of Disability Matters. A Lot. We call the definition of disability the heart of the policy. Why does it matter? There are many definitions of disability. The policy pays on the definition. Some definitions are a lot better than others. Did Laura make a good choice? Lets’ analyze some of the more popular definitions. There are four main types of definitions of disability (with a lot more in-between – we won’t discuss those). The best way is to view in an illustration as below. So, as you can see, as a policyholder, you want a pure own-occupation definition and not any occupation definition. What do they each specifically mean? We discuss next. You will receive a benefit if you can’t meet the material and substantial duties of your own occupation. The policy will pay even if you are employed elsewhere. Simply, it means you can continue to work in another occupation while receiving disability benefits for your own occupation. So, if you are a dental hygienist, as Laura is, and can’t use your hands, but you can greet people at Walmart, you will receive disability benefits in addition to your earnings as a Walmart greeter. Modified own occupation is a bit different. You will receive a disability benefit if you can’t meet the material and substantial duties of your own occupation. However, you can’t work in another job. So, if you worked as a Walmart greeter, you won’t receive disability benefits under the modified pure own occupation definition. Modified any occupation is a combination of the modified own occupation and any occupation. What is the any occupation definition? Well, first, it stinks. But we will get to that in a minute below. During the first 24 months, your inability to perform the substantial and material duties of your occupation and you are not engaged in any occupation for wage or profit. After 24 months, your inability to perform the substantial and material duties of any occupation for wage or profit in which you might be expected to be engaged, with due regard to your education, training, experience and you are not engaged in any occupation for wage or profit. This definition is OK. At least in the first two years, you have an own occupation definition. Note that many carriers allow you to change this modified own occupation side to either a pure definition or extend the benefit (from 24 months to a longer period). Of course, that comes at an extra cost. Finally, there is the stringent “any occupation” definition. This means, simply, if you can work in any gainful occupation (for which you are reasonably suited, considering your education, training, and experience), you won’t receive benefits. So, under this definition, Laura won’t receive a disability benefit based on her education and experience as a dental hygienist because the insurance carrier says you can work as a Walmart greeter. Social security uses a similar definition for its definition of disability. Predictably, the approval rate for benefits under the social security definition is low. So, What Does This Mean For Laura? 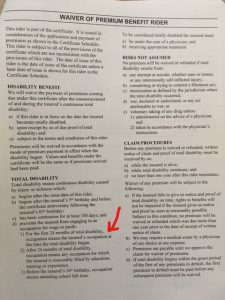 Looking at the verbiage in her life insurance contract, it is clear her definition of disability is an any occupation definition. As such, chances of the carrier paying any premiums because of disability are slim. What Is The Better Option For Waiver Of Premium? We feel Laura is out of luck. The carrier likely won’t pay her life insurance premiums unless she has a catastrophic illness or injury. Chances are, the agent isn’t even aware of the detail behind the waiver of premium. If he or she did, maybe it would not have been offered. Let’s say the waiver of premium had better provisions. The waiver costs $9 per month to protect $47. That is about 20% of the insurance premium. Is spending $9 to protect $47 a good option? We don’t think so. Thankfully, she has a better option. What is it? Simply enrolling in a long-term disability plan. Yes, it is that simple. And, we will discuss that further. For the same $9 per month, let’s see what kind of long-term disability options Laura has. Instead of the life insurance waiver of premium that protects only $47, she could enroll in a long-term disability plan for a benefit of $500 per month. Her elimination period would be 90 days (instead of 9 months). She would have a modified own occupation definition (instead of the any occupation). A 2-year benefit period available. For $0.50 more per month, she could change the first two years of the disability definition to a pure own occupation definition. She will have the important partial disability benefit. This means she will receive a benefit if she can work, but not full time. You might be thinking, Ugh, John. I don’t want to enroll in another plan and go through underwriting. Most disability insurance plans do not require full medical underwriting at this benefit level. The carrier looks up your background through the MIB and prescription drug databases. They may also require a phone interview. Hey, John, you say. The life insurance waiver of premium is for life. This disability benefit is only two years. Yes, that is true…if you qualify. Look at the verbiage in Laura’s life insurance waiver of premium. That is any occupation definition. She likely would not qualify unless her disability precludes her from working ANY occupation. Below is a waiver of premium rider of an insurance carrier. They use a modified any occupation. Better, but still limited to 2 years of own occupation. Moreover, the average long-term disability lasts around 1.5 years. That doesn’t mean yours will. If you are still disabled after 2 years, chances are you will qualify for social security benefits. All told, if Laura chose the above disability insurance plan, the premiums cost $8.50 per month. After paying for her life insurance premiums, Laura will have $453 left per month to spend on other important things. Think about that. For the same cost as the life insurance waiver of premium. If Laura felt she needed $1,000, she might be looking at $17 per month, give or take. Whereas most people do not have proper disability insurance coverage anyway, we feel a long-term disability insurance plan is the prudent choice. We feel a better option for the life insurance waiver of premium is a simple long-term disability insurance plan. The long-term disability insurance plan will offer more benefits and more coverage for potentially the same price or less. Sure, you have to fill out another application, but the underwriting is simplified. Do you need assistance in determining the right disability insurance? We can help. Feel free to contact us or use the form below. As with everything we do, we only work with your best interests first and foremost.